GLOBE Performance Solutions follows and uses the ISO 14034:2016 Environmental Management — Environmental Technology Verification (ETV) process and provides independent verification of technology performance claims so that users, developers, regulators, and other parties can make informed decisions about purchasing, applying, and regulating innovative technologies. ISO 14034:2016 builds vendor credibility and buyer confidence by providing assurance that technology performance claims are valid, credible, and supported by high quality, independent test data, and information. Generates credibility with prospective buyers and reduces procurement risk. Provides specific and precise technology performance claim verification, presented in an easily understood format. Provides a distinct market advantage for companies with verified technologies by helping to differentiate their performance. Expedites permitting and approvals for implementation and use of the technology. Supports the patenting process by providing verified claims. Increases national and international market recognition. This "Verification Screening" is cost-free. Global populations are facing a range of environmental challenges that will impact future prosperity such as; resource depletion, increasing water scarcity, air pollution, climate change and biodiversity loss. Innovative environmental technologies can provide solutions to environmental challenges while also increasing market competition. Market breakthroughs of new technological innovations can be challenging because innovations by definition cannot demonstrate a successful track-record. Without credible information about the performance claims of innovative technologies, potential buyers have no environmental product performance guarantees. Environmental Technology Verification (ETV) is designed to fill this gap. 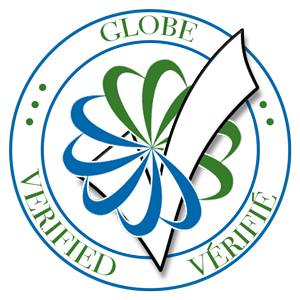 GLOBE’s Environmental Technology Verification (ETV) provides an independent evaluation of new technologies with a view to verify environmental claims so that users, developers, regulators, and other parties can make informed decisions about purchasing, applying and regulating innovative technologies. ETV was introduced in Canada in 1997 as part of the Canadian ETV Program in order to support the implementation of innovative environmental technologies. In 2016, the International Organization for Standardization (ISO) published ISO 14034:2016 Environmental management — Environmental technology verification (ETV) to standardize the ETV process at a global level. The International Standard ISO 14034:2016 is currently the basis for all ETV verifications completed by GLOBE Performance Solutions. ETV is not a certification scheme; instead, it ensures that a product’s environmental claims are true and verified, and presents a clear assessment of the technology’s environmental potential and value. Web-based assessments of technology solutions and technology user needs against best practices and internationally recognized performance benchmarks. Customer testimonials on technology performance categorized by sector. Regulatory roadmaps for navigating standards, protocols and certification requirements. Integrated information on market needs and enabling mechanisms to support market adoption. Verification is part of the Validation process. Verification of a technology performance claim requires the proponent to provide reliable, high quality data on the technology. For a technology to be eligible for verification, the performance claim must be specific and unambiguous. The claim must clearly specify the minimum and maximum performance that is achievable with the technology. The performance claim must also clearly specify the applicable operating conditions and be measurable using acceptable test procedures and analytical techniques. The data must be collected by an independent, third-party test agent and analyzed by an independent, accredited laboratory. Before confidential information is provided to GLOBE Performance Solutions and its associated testing and verification organizations, potential conflicts of interest must be resolved and a confidentiality agreement must be signed. The testing and verification organizations may be selected from the list of GLOBE Performance Solutions Consortium members. In some cases other testing and verification organizations may be selected based on the requirements for specific technology expertise. Stakeholder engagement and involvement are basic requirements for ensuring that local needs and related social impacts are adequately addressed in the determination of relevant performance parameters for performance verification. Testing and preparation of the test report is conducted by an independent testing organization. Specific high-quality data is required to determine the performance of the technology. The testing organization reviews the proposed performance parameters and any available technology-specific test results to determine whether additional data is required. The data related to the technology must be of sufficient quality and quantity to permit statistical analysis of the data at a 95% confidence level. The testing organization must be independent from the technology proponent (e.g., vendor). The test plan used to generate the performance data should be assessed against the test design required for the verification. The testing procedure must include a quality management plan to ensure compliance with the test data quality requirements. An audit of the test agent and analytical laboratory that generated the data may be required to show compliance with quality management system requirements. A verified claim is only valid if the technology is operated within the specified operating conditions. Data collected to support the technology performance claim must be collected within appropriate ranges of key operating parameters. Operating conditions during the testing must be monitored and documented to ensure that they are within the ranges defined in the experimental design. Information must be provided on the actual key operating variables during the test and the methodology used to monitor and document these conditions. The type of sample collected must be appropriate to generate data that can be used to verify the performance of the technology. Samples must be collected after sufficient time has elapsed to allow the process to stabilize, and to ensure that the samples are representative of the typical process characteristics at the sampling locations. The number of samples must be sufficient such that when the data supporting the claim is statistically analyzed, the claim can be accepted. The number of data required in any data set to be statistically acceptable will depend on the variability in the data and the nature of the technology and its application. It is the responsibility of the applicant to ensure that a sufficiently large number of data points are provided, with a sufficiently small variability, to be statistically acceptable. Acceptable sampling procedures or protocols must be used to collect and preserve samples including field and reagent blanks. Standard reference materials are required. All procedures and protocols must be applied by competent testing organization. The laboratory that analyzes the samples must be independent from the applicant, and accredited (under ISO 17025) by a recognized certification agency for the specific parameters being analyzed. In Canada, acceptable laboratory accreditation to the applicable technical testing scope must be earned from the Canadian Association of Environmental Analytical Laboratories (CAEAL), the Standards Council of Canada (SCC), or a signatory to the International Laboratory Accreditation Cooperation. Chain of custody refers to the ability to trace the possession and handling of the sample from the time of collection through analysis and final deposition to ensure the integrity of the process from sample collection to data reporting. Chain-of-custody reporting is used in routine control of sample flow, and in litigation if required. Acceptable chain of custody for sample analysis may include sample labels, sample seals, sample submission sheets, sample receipt log and assignment for analysis. Testing under actual operating conditions is required following an established test plan and prescribed methodologies. The instruments used to measure the operating parameters must be calibrated regularly to ensure that the instruments are providing accurate, reliable readings and these calibrations must be documented. Acceptable quality assurance/quality control (QA/QC) procedures must be used for sample collection and analysis. For sampling, QA/QC may include the use of blanks, spiked samples and replicate samples as well as inter-laboratory studies and use of standard reference materials. A test report is produced highlighting the test plan, methods used, results achieved, observations, and conclusions. The data must demonstrate that the technology has a measurable effect on the specific parameter(s) identified in the performance claim. Verification and preparation of the verification report is conducted by an independent verification organization. Verification of the technology requires specific and high-quality data to determine the performance of the technology. A general verification protocol (GVP) is used by the independent verification organization that is responsible for reviewing and verifying data and information that support the technology performance claim. The GVP contains an overview of the verification process, instructions for review of the technology, and a series of checklists that provide guidance to ensure that a comprehensive examination is undertaken. The GVP guides the verification organization through the process of determining the mandatory criteria (i.e., scientific soundness, absence of conflict of interest, environmental benefits) and requires an expression of the limitations of the technology, as well as validation of the actual performance data. The verification organization reviews the proposed performance parameters and the technology-specific test results to determine whether the data meets the objectives of the verification process. The data related to the technology must be of sufficient quality and quantity to permit statistical analysis of the data at a 95% confidence level. Statistical analysis worksheets are used to support this determination. The client receives a certificate of verification, a verification fact sheet and a verification report. The certificate does not constitute a guarantee of performance.